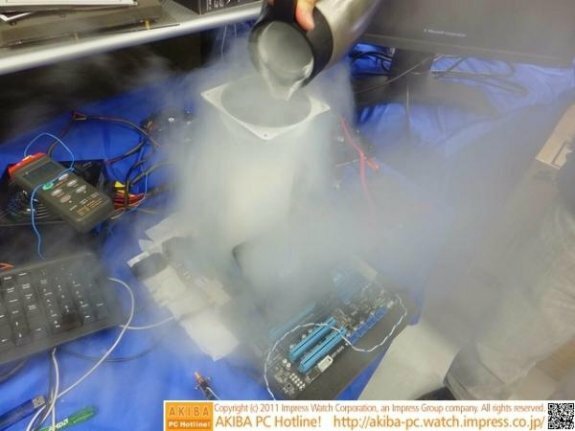 TweakTown reports Akiba managed to overclock AMD's Llano APU to 4.9GHz with the help of liquid nitrogen, you can check out all the screenshots and photos over here. The story goes that some lads over at the Japan Akihabara store had a couple retail chips to play with - an A8-3850 and A6-3650 with every intent to try squeezing the biggest overclock possible out of them. They grabbed the trusty GA-A75-UD4H motherboard for their base, along with an improved type of liquid nitrogen radiator setup to really push the boundaries.